For anyone who has been following art for the last 15 years, and for many who haven't, Tracey Emin has become a household name. Her ascendancy started when she displayed her unmade bed as part of her nomination for the Turner Prize. It may now be part of British art history but back then it was not well received — and after having been sold at auction last year it's back at its spiritual home of Tate Britain. There's no doubt that the art world has moved on and the YBAs are no longer as controversial, or even young for that matter. Emin herself has said that it's a part of her past but not part of who she is today. But does it still hold its power? In a word, yes: the soiled bedsheet, empty vodka bottles and cigarette packets still feel like a dark period in life — even under the bright gallery lights. It does feel like it's aged but there's still raw emotion behind it, unlike Emin's more recent work at the White Cube in Bermondsey. Across the walls are six of Emin's latest drawings of figures alongside two of Francis Bacon's paintings. It's a logical choice as it's clear to see that Emin's exploration of the figure has been inspired by Bacon's work. The downside is that even though these aren't Bacon's best works, they are far superior to Emin's and her subtle explorations pale in comparison to the energy of Bacon. For those who never got the chance to see Emin's bed in person back in 1999, here's a chance to see why it's still considered such a powerful work of introspection. The addition of two paintings by the excellent Francis Bacon makes this small display even more appealing. 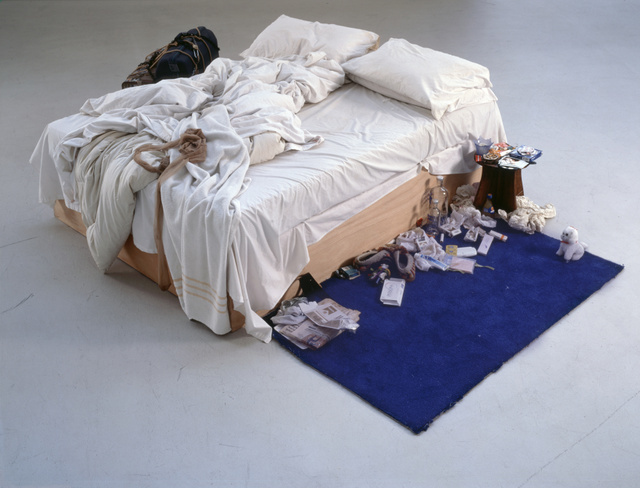 BP Spotlight: Tracey Emin and Francis Bacon is on at Tate Britain until June 2016. Entrance to the Tate and this display are free. Also still on at Tate Britain are the fantastic sculptures in Sculpture Victorious and early photographs in Salt and Silver. For more art to see visit our top 10 openings for April and our most talked about exhibitions in March.